So did he or didn’t he? 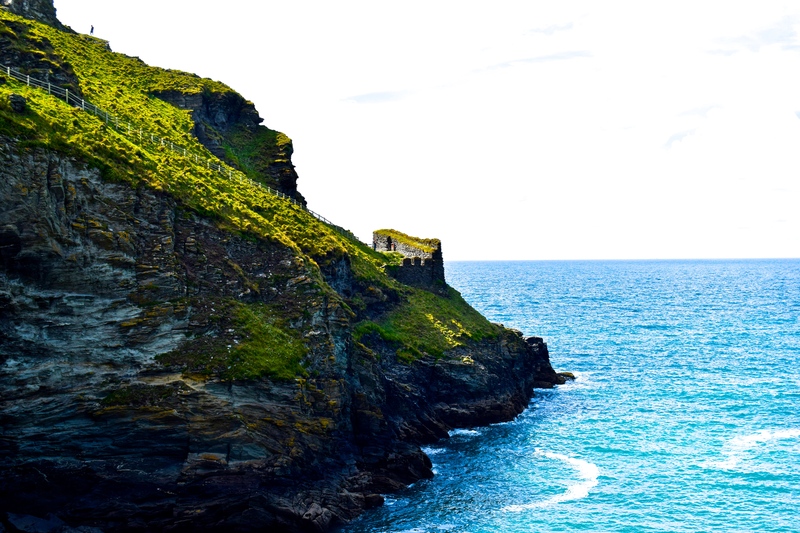 Arthur, that 6th century king who permeated Geoffrey of Monmouth’s History of the Kings of Britain: was his home on the precipice-high cliffs at Tintagel island, Cornwall? These days it is a dizzying slate-footed home for rare hardy birds and tourists. In winter the winds whip it cruelly, but in summer the breezes whisper through the rocks and tunnels and ruins of a bygone place. Geoffrey thought it Arthur’s home, and Alfred Lord Tennyson seemed to agree. And who could not, having seen this vast tall natural spit of land, towering above them, covered in ruins fraught with puzzles, almost completely severed from the mainland? I walked down the steep slope on Saturday last with Felix, Maddie and Ruth. We were determined to see Merlin’s Cave, if Merlin’s cave it be, which lies on the beach at the foot of the island. Tintagel is thought, following excavations, to have been sub-Roman: a settlement which sprang up in the wake of the departure of the Romans. Archaeologists have found rich pickings, evidence of finds from Visigothic Spain and the Byzantine Empire, of Mediterranean oil and wine jars which betray evidence of sophisticated trading with those in sunnier climes. And there is a king-making place. They call it King Arthur’s footprint: a man-made hollow in the stone at the island’s highest point on its southern side. It is thought this could be a place where chieftains were inaugurated. It is all hazy hearsay and speculation, the remit of the New Age taleweavers, is it not? One find casts a thin sliver of doubt on our scepticism. In 1998, Glasgow University Archaeological Research Division had a team working up on the island. Team member Kevin Brady found a slab of stone, one half of something larger, being used as a drain cover for a building. It had two inscriptions on it. The first was just four letters, and no-one has any idea what these might represent. Well, you can imagine the hullabaloo as folks began to realise that the name of Arthur was awfully like Artognou. Meaning ‘Bear knowing’, it squares up to names like the old Breton Arthnou and the Welsh Arthneu. Not only that, but the stone was firmly anchored at the time when Arthur was said to be running the Camelot setup. Typically, archaeologists distance themselves as far away from these theories as they possibly can.There is absolutely no reason to suspect a link with the Arthur of all those stories and histories. The stone sits in the Royal Cornwall Museum in Truro, Cornwall’s capital. It remains tight-lipped about whether the once and future king ever laid hands on it. Maybe we will have to wait for his return to find out the truth. Posted in Places to visit, Quirks of HistoryTagged Arthur, Cornwall, Geoffrey of Monmouth, history, King Arthur, sub roman, Tintagel, travelBookmark the permalink. It sure is, Myfanwy. Breathtaking and suffused with stories. It looks like you had lovely weather. The Arthur legend has always fascinated me. And since many of the Viking sagas have been proven through archeology, why not this one? Indeed, Andra. If we can find Richard III under a car park I’m sure we can track down Arthur. Arthur threw the stone all the way over the Burry inlet only for it to land on the top of Cefn Bryn! We also learned that at various times, the stone rolls around the Bryn to find a stream to take a drink. Another great tale and a land so similar to my own! Tony, I just put the Gower stone on my list of must-visits – thanks for the heads-up. I love the idea of a stone that rolls all by itself. I wonder if I can catch it on the move…. Thanks, Mouse: now I’m contemplating whether English Heritage would let us stay there overnight…. To Merlin’s Cave! How fun. It was, Nancy. A really magical place, though we had to climb over an inordinate amount of red seaweed to get there. Well, it always was a romantic notion, Arthur’s connection with Tintagel, ever since Geoffrey of Monmouth’s 12C narrative that mixed in folkloric and who knows what documentary elements with his imaginative pseudohistory of Britain. I’m more interested in the archaeology and history of the place which suggests there was indeed at least one ‘high status’ ruler here commanding a substantial settlement (possibly military) and with enough oomph to import a huge amount of East Mediterranean and North African pottery vessels containing exotic food and drink. I’m old school: I prefer to think of Arthgnou and his contemporaries as ‘Arthur-type figures’ without encumbering them with the weight and panoply of our own anachronistic visions, formed and added to over the millennium that the Arthurian legends have evolved to produce the many-headed Hydra we now contemplate! I love that attitude. The archaeology of Tintagel is amazing and bears much examination. Myself, I just like to sit up there on the bare slate, on top of the world, gazing down at the ragged coastline and those green, green National Trust-protected hills. I loved our visit there – a magical place which makes one tend to want to swallow the whole Arthurian legend whole and ask for seconds. Archaeologists are a dour bunch, aren’t they? Sounds intriguing. I do hope evidence proving Arthur’s existence is found. But if not, it’s a wonderful story, like so many others.